We just posted a review of a the most notable new luxury hotel in Peru to come along in a while: Inkaterra’s La Casona Hotel in Cusco. This is the first hotel to give any real competition to the venerable Hotel Monasterio, so it’s a welcome addition to the scene for high-end travelers not satisfied with the Libertador or Casa Andina Private Collection. It’s an intimate historic building with plenty of space behind your closed door. All of its 11 rooms are spacious open suites, with baths almost as large as the sleeping area. These are definitely the most splashed-out rooms in town as well, with all the latest and greatest gadgets and radiant heat flooring. Both the public rooms and the guest rooms are tastefully stocked with Spanish Colonial antiques, oil paintings, and custom carved wood doors. I stayed across the plaza and didn’t get a chance to try the restaurant or bar here, but judging by the attention to detail elsewhere, teatime and dinner time should both be a treat. 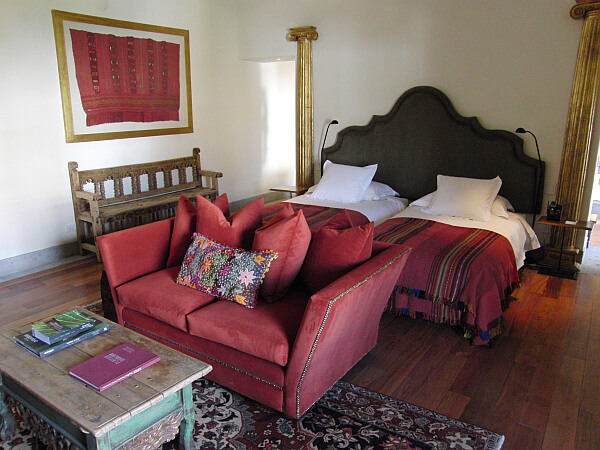 See the full review of Inkaterra La Casona. What’s the Impact of Galapagos Land Tours vs. Ship Tours? This is a luxury travel blog focused on upscale vacations in Mexico, Central America, and South America, with occasional posts on Latin American spirits, wine, and tourism trends. Sign up for our monthly newsletter here! © 2019 Luxury Latin America Blog. All Rights Reserved.